Farmers will need to change their management strategies over the next few decades to adapt to impending climate extremes, according to a study recently published by researchers at Auburn University and Pennsylvania State University. The study, featured in the June 11 issue of the open access journal PLOS ONE, is the first climate change study on corn that focuses on aspects of growth and development from an agronomic viewpoint. The majority of such studies have used either simulation or statistical models to evaluate yield losses. And while the research itself focuses on three northeastern U.S. states, the general conclusions are applicable for all regions, including the Southeast, says Rishi Prasad, an assistant professor in the Auburn College of Agriculture’s Department of Crop, Soil and Environmental Sciences and an extension specialist with the Alabama Cooperative Extension System. “We need to investigate the Southern region as well,” said Prasad, who began the initial study during his time as a post-doctoral scholar at Pasture Systems and Watershed Management Research Unit of USDA’s Agricultural Research Service at Penn State. The warming trends occurring are specific to location, he says. 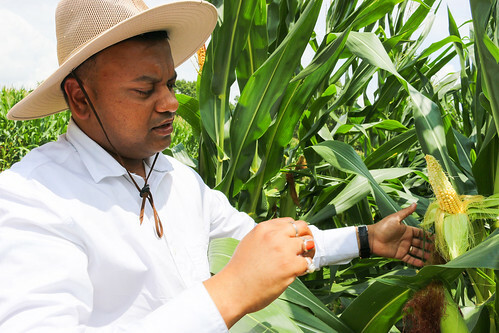 Prasad and his colleagues chose corn as the subject of their study because of its importance to U.S. agriculture, offering many possibilities for feeding and fueling a growing world population. While mean annual temperatures already have increased throughout the world, the global temperature is expected to increase further by 36 degrees Fahrenheit by 2050, Prasad said, and the local effects on heat, cold and precipitation extremes will vary widely, with regional differences in geography and landscape features. Corn production in the northeast U.S. will suffer from the impacts of climate extremes like other corn-growing regions, but it draws special attention from researchers because it is a major dairy region, and corn is a major feed for the industry. Also, the Northeast is cited as the fastest-warming region in the contiguous U.S.
“Most climate-change studies on corn have been carried out in the Midwest and Great Plains, with little attention to the Northeast, so we saw a need to evaluate the local risks of extreme climate on corn production in the region,” Prasad said. Although several global and regional studies have evaluated heat and water stress effects on corn yield using historical weather data, there is less information on growth-stage-specific anomalies in corn production at local levels, he said. The study views data from nine different climate models that simulate the climate of the entire world. Researchers used the climate models looking 100 years into the future, all the way to the end of the 21st century. They considered current farming practices, such as the time when farmers are planting and harvesting their corn. The study focused on locations in New York and Pennsylvania, where corn production provides feed for the dairy industry. The study concludes that if farmers continue with current management practices, there will be a dramatic decrease in yield, and the reason for that is two-fold, he said. The study goes on to recommend possible remedies for corn producers, including a shift in planting dates and irrigation. Also, with the widening gap between evapotranspiration and precipitation, especially during corn’s prime reproductive phase, irrigation is recommended. Prasad’s research at Auburn continues to focus on the development of next-generation best management practices for crop-livestock systems. Also involved in the research were Heather Karsten, associate professor of crop production ecology, and Greg Roth, professor of agronomy, Pennsylvania State University; Alan Rotz, Stephan Kpoti Gunn and Anthony Buda, all with the Pasture Systems and Watershed Management Research Unit, U.S. Department of Agriculture's Agricultural Research Service; and Anne Stoner, Climate Science Center, Texas Tech University. This research was supported by the U.S. Department of Agriculture's Agricultural Research Service. The Auburn University Studio at Tichenor Hall is available for live HD video interviews with Auburn University experts through LTN Global Networks. If you are with a media outlet that is a member of LTN and would like to schedule a live interview about this story, visit our LTN webpage for more details. Auburn University scientist Rishi Prasad led a study that indicates farmers will need to change their management strategies over the next few decades to adapt to impending climate extremes.